BERKELEY, CA -- Recent ice ages -- ten periods of glaciation in the past million years -- are caused by changes in the tilt of the Earth's orbit, according to research published in the July 11 issue of Science magazine. The new analysis also presents strong evidence that another long prevailing theory does not account for these ice ages. Researchers Richard A. Muller of the Ernest Orlando Lawrence Berkeley National Laboratory (Berkeley Lab), and Gordon J. MacDonald of the International Institute for Applied Systems Analysis, Austria, are co-authors of the Science article. Muller and MacDonald report that cyclical changes in the location of the Earth's orbit cause differing quantities of extraterrestrial debris to come into the Earth's atmosphere. This, in turn, results in variations of climate on the planet. Said MacDonald, "As the Earth moves up and down in the plane of the solar system, it runs into various amounts of debris, dust and meteoroids. Our work was an outgrowth of investigations of larger impacts, such as the comet or asteroid that killed the dinosaurs. However, meteoroids and dust are much smaller and more spread-out over time." Muller notes that this new research has important implications for the understanding of the present climate, and for predictions of future climate. "As far as we know," he said, "none of the present climate models include the effects of dust and meteors. And yet our data suggests that such accretion played the dominant role in the climate for the last million years. If we wish to make accurate predictions, we must understand the role played by such material." Despite the current relatively warm climate on Earth, regular recurring epochs of glaciation have dominated the planet for the past million years. Ten times, glaciers have advanced and then retreated with the duration of retreat (and corresponding warmth) frequently lasting not more than 10,000 years. The Earth has been in a warm period for about 10,000 years now. In the paper in Science, the researchers compared the geological record to the climactic cycles that would result from their theory and to that of the competing theory, first published in 1912 by Serbian scientist Milutin Milankovitch. Using a geological fingerprinting technique, Muller and MacDonald found that the climactic changes recorded in the rocks matched their theory but not that of Milankovitch. Milankovitch said the ice ages are caused by variations in sunlight hitting the continents. In his theory, the ice ages are linked to "eccentricity," a very gradual, cyclic change in the shape of the Earth's egg-shaped orbit around the sun that completes a cycle roughly every 100,000 years. Eccentricity changes the Earth's average annual distance from the sun and slightly alters the amount of sunlight hitting the Earth. To visualize the different astronomical cycle that Muller and MacDonald have found to match that of the climatic record, imagine a flat plane with the sun in the center and nine planets circling close to the plane. In fact, all the planets orbit the sun close to such a fixed orbital plane. The Earth's orbit slowly tilts out of this plane and then returns. As Muller first calculated in 1993, the cycle of tilt repeats every 100,000 years. In their Science paper, Muller and MacDonald examine the geological record of the past million years to see which of the two 100,000-year cycles (eccentricity or tilt) matched the data. They applied a technique called spectral analysis to ocean sediments taken from eight locations around the world, examining the oxygen-18 composition. This isotope is generally accepted to reflect the percentage of the Earth's water frozen in ice. Muller and MacDonald's analysis yields "spectral fingerprints" which can be compared to the predictions of the two theories. Their analysis shows a clear pattern: The fingerprints of the ice ages show a single dominant feature, a peak with a period of 100,000 years. This precisely matches their theory. The fingerprints do not match the expected trio of peaks predicted by the Milankovitch theory. Said Muller, "The mechanism proposed by Milankovitch could be adjusted to explain the cycles of glaciation that occurred prior to one million years ago. However, for the past million years the glacial record is an excellent match to the cycle of tilt." Berkeley Lab conducts unclassified scientific research for the U.S. Department of Energy. It is located in Berkeley, California and is managed by the University of California. - A period of time during which ice sheets (continental glaciers) cover substantial portions of the continent. * Pennsylvanian/Permian (around 250 million years ago). - What's the evidence? Determine where glacial sediment deposits lie in the stratigraphic record. - During an individual ice age, there may be several glacial advances (ice sheet grows; a glacial interval) and intervening glacial retreats (ice sheet shrinks; an interglacial interval). - Time between advances and retreats is tens to hundreds of thousands of years. * Identify distinct layers of till separated by paleosols (ancient soil horizons). * Marine record (better preserved) contains evidence for more than 20 advances. Geologists look at isotopes in plankton shells, because these depend on temperature, so it's possible for them to determine when the oceans were warmer, and when they were colder. - Position of the continents; need to have continents drift into high latitudes (i.e., closer to pole) so they can be cool. - Concentration of carbon dioxide in the atmosphere. - So when there is more CO2 the atmosphere gets warmer, while when there is less CO2 the atmosphere gets cooler. - Controls on CO2 concentration are complex. Depends on volcanic eruptions, character of life, etc. - When the continents are in the right position, and there are ice house conditions, an ice age is possible. age probably are controlled by the Milankovitch cycle (a periodic change in the tilt of the Earth's axis and the ellipticity of the Earth's orbit). - Earth's orbit varies between more circular and more elliptical. When it's more elliptical, earth gets further from the sun and can be cooler. - Earth's axis wobbles. When the axis is more tilted, the sunlight on continents at high latitudes is more direct, so they have warmer summers. - When there's a combination of high tilt and more elliptical orbit, earth has cooler climate, and glaciers can advance. 1) Milankovitch conditions are appropriate for ice to accumulate. Glaciers advance. 2) Land becomes covered with snow and ice, so albedo (reflectivity) increases. Because sunlight is reflected by earth's surface, rather than absorbed, the earth gets even cooler. So glaciers continue to grow. 3) Water gets stored in the ice sheet, so sea level drops (continental shelf becomes dry land). Also, ocean freezes over. Net consequence is that amount of water supplied by evaporation decreases. 4) Weight of glacier depresses the surface of the land, so the surface elevation of ice sheet drops to lower (i.e. warmer) elevations. 5) The glacier starts to recede. IV) What the future holds. - Big question is whether we are currently in an interglacial period (i.e. between two advances) or whether the Pleistocene ice age is over for good. - There was a small advance during the "Little Ice Age" that happened a few hundred years ago. But in the last couple of centuries, glaciers have retreated substantially. - An added factor is that people are now changing the concentration of carbon dioxide, by burning fossil fuel. Burning produces CO2. Thus, CO2 that had been stored in the underground reservoir is now being released to the atmosphere. - The concentration of CO2 in the atmosphere has measurably increased since the industrial revolution. Since CO2 is a greenhouse gas, this could cause global warming. - The atmosphere has clearly warmed too. But there is not total agreement about whether human added CO2 is the cause, or whether natural cycling is the cause. - It is possible that human-caused global warming could be a major problem. Ice ages are actually rare events in the Earth's 4.5 billion year history. In fact, the most recent ice ages occurred during the relatively recent Pleistocene epoch, beginning about two million years ago. What initiates an ice age? We begin by first increasing the Earth's albedo, causing a loss of insolation. This increase in albedo began about 15 million years ago, when the Antarctic continent moved over the South Pole which led to the development of a permanent polar ice cap. To supplement this change in albedo in the Southern Hemisphere, continental rearrangements about 3-5 million years ago placed the northern regions of Greenland, Canada, Russia, and Alaska as a fringe around the Arctic Ocean, cutting off warm ocean circulation to the North Pole. The Earth's albedo is about 33% as a whole, but the ice caps reflect about 80% of insolation, thus reducing the amount of energy retained by the Earth. The stage was set for development of an Ice Age. But why hasn't the Earth remained uniformly cold in the last two million years? Why have we had alternating cold and warm spells? The most acceptable theory for the development of and ice age was put forward in the 1930s by the Yugoslav Milutin Milankovitch, who used a sequence of cyclic variations in the Earth itself. First, variations in eccentricity: the Earth's orbit changes its elliptical pattern every 100,000 years, changing between a more circular orbit to one very elliptical. Circular orbits mean more uniform receipt of energy from season to season and from year to year. Second, variations in obliquity: every 40,000 years, the tilt of the Earth's axis shifts between 21.8 and 24.4 degrees. A more severe tilt means a greater contrast in seasonal distribution of energy. A lower tilt means more uniform receipt of energy between the seasons. Also, the polar regions will receive more energy during periods with low tilt angles. Third, variations in precession: the Earth's zenith changes every 21,000 years, changing from pointing to the North Star to another area, causing a precession of the equinoxes. For example, what was once the spring equinox will be the fall equinox 10,500-11,000 years later. This phenomenon affects the amount of incoming energy. All these effects will (1) change the total amount of insolation received, (2) change and redistribute the amount of insolation received latitudinally, and (3) change the insolation received temporally. In 1976, for the first time, irrefutable evidence of these cycles was found in sediment cores taken from the deep ocean, confirming the Milankovitch Theory. These ocean sediments contain fossils that provide precise temperature variations. The Milankovitch pattern has been found in sediments dating back eight million years, but one important change has been detected. Eight million years ago, the 100,000 year cycle was weak, but became stronger in the last two million years. This cycle has dominated the glacial/interglacial sequence, but why has its influence changed? The Earth's orbit can not change. The answer lies in the ice masses themselves created during an ice age. The ice grows slowly but decays rapidly. The ice itself modifies global climate which enhances the effects of the 100,000 year cycle. The distribution of land masses and ocean bodies is a major contributing factor. Hence, the Milankovitch cycles just happened to accentuate an already declining situation with the movement of lithospheric plates. Feedback effects also contributed to glaciations. For example, during warm interglacials, increased organic activity will lead to an increase in carbon dioxide and methane, confirmed in the ice core record from Greenland. These are greenhouse gases and contribute to warm the Earth during interglacials. The anatomy of plants will change in response to glaciations. For example, during warm interglacials, plants will need fewer stomata (e.g., analyzing the stomatal density of subfossil plants) to uptake the carbon dioxide, and this has recently been proven. Another theory concerning glaciations is the conveyor system that contributes to the North Atlantic Deep Water (NADW). Warm waters are brought to the North Atlantic in a conveyor system in deep ocean currents at about 800 meters. (Do not confuse this with surface circulation, such as the warm Gulf Stream.) This conveyor system effectively redistributes the energy surplus found around the equator to regions of energy deficit in the higher latitudes. Fossil evidence shows this conveyor system became switched off during glacial periods, causing no warm water to reach the north Atlantic. This contributed to the intensification of polar cooling. However, scientists are unclear on what could shut down the conveyor system, perhaps changes in ocean salinity, and therefore the density of the deep ocean water. Finally, a favorite theory proposed that may contribute to glacial periods is volcanic activity. An increase in volcanism will increase the amount of dust particles in the atmosphere, thus reducing the amount of insolation, and thereby reducing global temperatures. Scientists have shown that volcanism has indeed increased during the most recent two million years! But why? This would suggest an increase in subductive activity at plate margins, and therefore an increase in convective activity within the Earth. Therefore, one must ask, do the origins of ice ages lie in variations of the temperature of the Earth's interior? The increased dust particles would also contribute to increased precipitation as more condensation nuclei are found in the air. Both consequences would contribute to a general overall global cooling. Throughout recent evolution, the environment continued to play an important role. To be sure, environmental changes act as the motor of evolution, allowing some life forms to adapt while forcing others to become extinct. And, on Earth, some of the most important environmental changes are caused by our climate. As shown by the plot, our planet has cycled through numerous episodes of cool, dry climate--intermittent periods popularly known as ice ages. Although the data are sketchy, each cold ice age, as well as its opposite warm interglacial period, lasted roughly 50,000 years. We now reside in an interglacial period--a temporary thaw of sorts before heading back into the deep freeze. What causes these cycles of heating and cooling on our planet? Some geologists contend that glaciation increases during the periods of global volcanic activity when ejected dust reduces the amount of sunlight penetrating Earth's atmosphere. Others suggest that the periodic reversals in Earth's magnetic field cause the protective Van Allen Belts to disappear, thereby sporadically allowing unusually high doses of solar radiation to heat the ground and thus decrease glaciation. Still other researchers have noted that ice ages could be triggered on our planet by variations in the output of the Sun itself, by passage of Earth through an interstellar dust cloud, by deep circulation of Earth's oceans, or by any one of a long list of other proposals. Recently, however, oceanographers have found convincing evidence to support yet another theory, dubbed the "Milankovitch effect" after the Yugoslavian geophysicist who proposed it earlier in this century. According to this theory, subtle though regular changes in Earth's orbit around the Sun initiate the ice ages. These changes are the combined result of three astronomical effects, each caused by the normal gravitational influence of other planets on the Earth: (1) changes in the shape (called "eccentricity") of Earth's elliptical orbit around the Sun, (2) changes in the tilt or wobble (called "precession") of Earth axis, and (3) changes in the orientation (called "obliquity") of Earth's tilt relative to its orbit, an effect caused by the ever-changing positions of the other planets. Specifically, the shape of Earth's orbit changes approximately every 100,000 years, becoming more circular, then more elliptical. When the orbit is most elliptical, the Earth receives 20 to 30 percent more radiation when it is closest to the Sun than when it is most distant. Second, Earth wobbles on its axis every 26,000 years, thus changing the time in Earth's orbit when winter and summer occur. Finally, over a period of about 40,000 years, the tilt of the Earth (relative to its orbital plane) varies from 22.1 to 24.5 arc degrees, the smaller tilt resulting in smaller temperature differences between winter and summer. The first phenomenon would produce warmer summers and colder winters. The second affects the heat mostly during the summer months, and conceivably the amount of ice melting. And the third probably results in cooler summers with less ice melting. The combination of these three effects--for all three operate simultaneously--would sometimes cause abnormal solar heating (such as we are now experiencing); at other times, solar heating is distinctly reduced, producing widespread glaciation and a decline in global temperature. This theory of an astronomically induced ice age is currently favored among the majority of scientists, mainly because samples of seafloor sediments show that during the past 500,000 years, tiny sea creatures called plankton have thrived at certain times, while barely surviving at others. Studies of the abundance of fossilized plankton known to prefer warm or cold water provide estimates of the prevailing water temperature during their lives. This inferred sea temperature correlates well with the expected heating and cooling of Earth by means of the combined astronomical effects just noted. It seems, then, that slight peculiarities in Earth's orbital geometry are mainly responsible for triggering ice ages; whether they are the only trigger remains to be proved by further research. Regardless of their cause, ice ages must have had profound effects on the evolution of life on Earth. The most recent major glaciation began about 75,000 years ago; the climate had returned to its present, "normal" state some 10,000 years ago. As depicted by Figure 7.15, at the peak of this ice age roughly 30,000 years ago, a kilometer-thick ice sheet extended from the North Pole far enough south to cover much of the northern United States, as well as much of northern and central Eurasia. Earth's overall surface temperature averaged 5 kelvin lower than today's, while the sea level, with much water locked up in icebergs, was nearly 100 meters below current values. FIGURE 7.15 -- Glacial ice covered much of the Earth at the peak of the last major ice age, some tens of thousands of years ago. The last 10, 000 years have seen the glaciers retreat, the coastal plains flood, the vegetation climb toward northerly latitudes, and the ocean and atmosphere warm up. The change in climate from the peak of the most recent ice age to its present state occurred rapidly, by geological standards. These widespread changes in Earth's environment surely helped foster the many advances made by our human ancestors during this period of rich innovation. Humans were forced to adapt--biologically, culturally, and rapidly--to changes throughout the air, sea, and land. The motor of evolution had quickened. The ice ages themselves may have accelerated the migration and colonization of new lands. For example, we know that humans did not evolve in the Americas; there is no fossil evidence for ape-like creatures from which they could have ascended. Current anthropological consensus contends that humans arrived in the new world of the Americas as recently as a few tens of thousands of years ago--and possibly as recently as 12,000 years ago. Precisely how they did it is unknown, but during one of the more recent glaciations, enough water would have been wrapped up in ice to have permitted humans to walk dry-shod across the Bering Strait between what are now called Alaska and Siberia. This is in fact the prevailing view; native North, Central, and South Americans are descendants of Asians who wandered here only a few hundred centuries ago. Once settled in the Americas, these migrants developed arts, languages, products, and numerous other cultural innovations. Whether the civilizations of the Americas experienced cultural evolution independent of those in Eurasia, or whether they had some as-yet undiscovered contact with them, is a central point of controversy in modern archeology. The role that geological and astronomical catastrophes have played in the history of the solar system, and our planet in particular, has become more widely examined over the past 25 years . In this new avenue of research, both astronomers and geologists have become aware of the important part played by impacting comets and/or asteroids . One major segment of current geological inquiry concentrates on life-form extinctions at the geological boundaries, plus the evidence of simultaneous major earth movements . A concise overview of one possible model, among many that may explain some of these events, is given below. It is based on the evidence for changing light-speed as presented in an August 1987 research report for SRI International and Flinders University , and a major scientific paper that has been undergoing a review process throughout 2000 and 2001 . These two papers cite observational evidence that indicates light-speed, c, has dropped exponentially from an initial value of the order of 4 x 1011 times its current speed. The evidence comes from light emitted by galaxies near the frontiers of the cosmos, which has a signature in it that reveals the value of c at the moment of emission. This signature allows the behaviour of light-speed over time to be determined astronomically, in addition to the ground-based observations over the last 350 years. These two papers demonstrate that the atomic clock, whereby the age of the rocks, the fossils, the planets and stars have all been determined, ticks at a rate dependent upon c. Thus when c was 10 times its present value, the atomic clock ticked off 10 years in one ordinary orbital year. This process includes all radiometric clocks, which are used to determine the age of the geological strata. (Despite the behaviour of the atomic clock, it is shown in the second paper  that chemical reaction rates, and hence primary biological processes, remain basically independent of c.) As the behaviour of c with time has thereby been established from observation, it is then possible to correct the atomic clock to read actual orbital time. When this is done, an interesting scenario emerges. Some meteorites are taken to represent samples of material from the formation of the solar system and hence the Earth. For example, carbonaceous chondrites, may hold more than 20% water locked up in their mineral structures . More specifically, carbonaceous chondrites of class CI are made up of hydrated silicates as well as the volatile components water, carbon dioxide, oxygen and nitrogen . By way of an earthly example, the beautiful mineral serpentine is a hydrated silicate that contains 12.9% water in its composition . Upon heating, this water is given up and the mineral turns to olivine, thereby reducing its volume . Interestingly, olivine is an important component of the earth's mantle. In a similar way, other hydrated silicates, found in meteorites and on earth, may give up their water content when heated sufficiently, with a consequent reduction in volume. Indeed, the chondrules within the chondrite meteorites themselves are silicate spherules that have been melted and the volatile water component driven off. The remaining minerals in the chondrules contain a prominent amount of olivine . After creation week, the interior of the earth began to heat up from the rapid decay of short half-life radioactive elements as a result of high light-speed values. This radioactive heating drove the water out of serpentine, and other minerals in the mantle, towards the earth's surface. This water came to the surface as springs and geysers and watered the ground. This is confirmed by the earliest known translation of the Pentateuch, the Septuagint (LXX), that originated about 285 BC , and from which the Patriarchal dates in this Summary are taken. The LXX specifically states in Genesis 2:6 that "fountains" sprang up from the ground. These fountains and springs probably watered the whole landmass of the single super-continent that made up the original land surface of the earth. In the surrounding ocean, this continuing water supply was called the "fountains of the deep." On a greatly reduced scale, a similar phenomenon still occurs today with the "black smokers" of the South-East Pacific Rise. Similar events were happening out in space. For instance, the original parent body (or bodies) of the current asteroids, which primarily inhabit the region between Mars and Jupiter, was undergoing a process paralleling that on earth. This process of short half-life radioactive heating of its interior reached a peak, which reset the radiometric clocks. The time of the advent of this peak was about 4.5 to 4.4 billion atomic years ago. This parent body probably came to be internally structured with something approaching an iron core, stony-iron mantle, chondritic upper mantle or crust, and, perhaps, an ice or frozen carbon dioxide surface layer. As this planet continued to heat up internally, the pressure of super-critical water and expanding rock may well have caused it to explode. It is acknowledged that radioactive heating from the short half-life elements could structure the interior of bodies larger than 10 km in this fashion, and then, following disruption, give rise to the meteorites . Indeed, "it is now thought that the majority of meteorites come from the asteroids whose diversity amply covers all classes of meteorites. The achondrites could come from the 'crust' or 'mantle,' the siderites from the cores, and the lithosiderites from the mantle/core interface [of the original parent body/bodies]" . In addition, recent work has indicated that leftover ice and rock from the region of Neptune's orbit may also have been responsible for some short-period comets and other debris . A series of impacts by this variety of objects has been noted on the Earth, Moon, Mercury, Mars, and elsewhere in the solar system. Radioactive heating also continued on earth, with the first signs of molten rock intruded in the near-surface region about 4.4 to 4.3 billion atomic years ago. On the light-speed correction, this probably occurred shortly after the birth of Methuselah, which is dated around 4505 BC by the LXX chronology adopted here. Importantly, there is evidence from zircon grains that water was associated with this activity in some way . Indeed, as the heating continued, more and more super-critical water built up beneath the crust. The increased heating partly liquefied some sub-crustal rock, which moved towards the surface through interconnected pores. This eventually resulted in the intrusion of granitic massifs and associated metamorphic complexes that formed many of the stable craton or shield areas worldwide around 2800 ­ 2400 million atomic years ago . The presence of large quantities of water in these magmas may well have allowed the kind of low-temperature metamorphism investigated by Prof. R. L. Stanton , Dr. A. Snelling , and others . As a result, the metamorphism associated with these intrusions may not have penetrated the original sedimentary cover, even though the cratons and complexes were major crustal features. On the light-speed correction, the formation of these shield areas, which peaked near the Archaean/Proterozoic boundary 2500 million atomic years ago, roughly corresponds with the birth of Noah in 4136 BC. As serpentine changed to olivine, and other hydrated silicates lost their water content, there was a reduction in mineral volume. Consequently, the crust above the source areas for the water and magma would be weakened relative to the stable cratonic areas that had been solidly emplaced. This would be a major contributing factor to the predominantly vertical tectonic activity that generally dominated the Precambrian, instead of the horizontal forces of plate tectonics that predominated in the Mesozoic-Cenozoic history of the earth [20, 21]. These strong vertical movements in these weakened regions of the crust would result in intercratonic basins. In the case of South Australia, the Adelaide Geosyncline downwarped some 10 km, while the major faults and other structural features controlling these events extended to some 20 km depth . On a worldwide scale, the downwarping formed a network of intercratonic basins that became mobile belts. Read and Watson point out a striking fact: "The network of mobile belts is closely followed by the margins of the present-day continental fragments. This aspect of the orogenic pattern suggests that when disruption of [the super-continent] began, fracturing followed the lines of the recently consolidated mobile belts" . In other words, the stable cratons formed the core areas of what today are the continental fragments. By contrast, the weakened, downwarped areas were the regions that formed the boundaries of what was to later become the tectonic plates. The Geology of Catastrophe 1. The initiation of a series of geologically mobile belts bordering the shield areas of the super-continent can be approximately dated as 800 ­ 900 million atomic years. At that time, the weakened crustal regions began to either downwarp or sink into fault-controlled basins. The activity continued to build up from that point and reached a climax at the time of the Flood. Interestingly, Noah was given the command to build the Ark around 3656 BC, corresponding to 870 million years atomically, which was just the time that this activity began. As the heating continued in the earth's interior, the pressure increased and eventually fractured the crust and the water explosively out-gassed to the surface. The pressure of the overlying crust may well have jetted the mixture of water and chewed-out debris as high as 20 km in a series of massive explosive eruptions circling the earth. As such, it would be an eruption on a worldwide scale similar to the local eruption of Krakatoa in 1883 AD where dense volcanic clouds reached a height of 27 km , compared with the 19 km of Mount St. Helens in 1980 AD . Studies by Dr. Walter Brown suggest that about half the present volume of the oceans may have been explosively out-gassed from the earth's interior in that episode . As the surge of water intensified, the sediments on top of the cratons were stripped off and swept into the rapidly deepening troughs. Water-lubricated fault systems assisted this process that formed a worldwide network of mobile belts. Some time after the Flood event concluded, these troughs stabilised and many were uplifted. This event correlates well with the debris layer that is found on all continents, except India, a little below the boundary between the Proterozoic and the Cambrian. This debris layer is composed of pebbles, cobbles and boulders bound together in a cement-like matrix. It is called a conglomerate, or diamictite, or tillite. However, the latter term implies a glacial origin. For this reason, one of the current explanations for this worldwide debris layer invokes a "snowball earth" scenario. This scenario postulates that the whole planet is iced over, including the oceans, with glaciers existing at sea level in the tropics [27, 28, 29]. However, Williams and Schmidt list off 10 solid geological reasons why this scenario must be invalid and a different explanation must be sought . Near Adelaide, in South Australia, this initial debris layer is over 300 metres thick , while the following deep-water laminated siltstone is over 2400 metres thick and has a high carbon content . This sequence has its counterpart worldwide. In Scotland, for example, the detrital layer is 750 metres thick . In Zaire and Zambia the "Grand Conglomerat" is 300 metres thick and is overlain by about 500 metres of carbonaceous silty shale and black limestone in a manner very similar to the equivalent beds in Adelaide . Geologically, this event dates from the Neo-Proterozoic around 720 million years ago atomically. This closely approximates the time of Noah's Flood, 3536 BC, when the atomic clock is corrected for light-speed variation. A post-Flood tectonic adjustment occurred as the fault systems began to stabilise some 60 orbital years later, which gives an age to the strata laid down then of around 600 million years ago atomically. The Palaeozoic Era that followed saw continuing deposition in intra-continental basins or downwarped areas until the rising landforms restricted deposition to the margins of the super-continent. This Era lasted 306 orbital years during which the Palaeozoic strata were laid down, while intrusives into that strata dated from about 600 million down to 250 million years atomically. During this Era, a portion of the southern part of the super-continent straddled the South Pole. As moisture-laden air swept over the pole, vast amounts of ice and snow were precipitated. This resulted in widespread glacial deposits over that portion of the land surface . Many insects would have survived the Flood on floating vegetation mats, which would have been much larger than, but similar to, the floating mats caused by lesser floods today. These are known to harbour a great deal of life. Even amphibians, while at home in the water, probably found the mats assisted survival. The insects and amphibians would be able to thrive in the moisture-laden atmosphere and the large bodies of warm water left over from the Flood process. These warm, humid conditions would also favour the spore-bearing plants, the algae, mosses and ferns. Consequently, these flora and fauna would be the most rapidly proliferating life forms after the Flood, explaining their predominance in the fossil record at that point. By contrast, other life forms were at a disadvantage and only started the Era in very small numbers. Meanwhile, the radioactive heating of the earth's interior continued. Eventually the stage was reached when significant portions of the upper mantle became molten. An episode of rampant volcanism would have followed. It produced the Siberian flood basalts, while associated earth movements resulted in massive tidal waves that swept huge quantities of vegetation into fault-controlled troughs, which then formed the major coal measures . This event dates around 250 million atomic years ago, or about 3230 BC on a light-speed correction, approximately the time of the Babel crisis in the second or third generation after the Flood, according to Genesis 10. It is interesting to note that Aboriginal legends in Australia link the origin of different languages (Babel) with the formation of coal . Geologically it is known as the time of the Permian extinction, and recent evidence from Japan and China suggests that an asteroid or comet impact may have played a part also . It is also possible that the Siberian flood basalts may hide another impact crater. During the Mesozoic Era that followed, active deposition of sediments took place around the rim of the super-continent over a period of 225 orbital years. The change in atmospheric conditions brought about by volcanism produced a dry and windy climate generally. This resulted in the great wind-blown sand deposits that typify this Era. The semi-desert climate would have decimated the amphibians, and spore-bearing plants, and favoured the increasing numbers of reptiles that lived in broad, luxuriant river valleys. The plants best adapted to this climate were those that propagate by wind-blown pollen, namely the gymnosperms, which include the palms and pines. These were the dominant life-forms during the Mesozoic Era, and thus they are the primary forms that we find fossilised in this Era. Much human and animal migration must have taken place during the two centuries of orbital time that this Era occupied before the worst phases of continental drift occurred. As the heating of the mantle continued, the mantle itself became increasingly mobile, Furthermore, a significant water content would have built up in the asthenosphere, a plastic layer at the base of the lithosphere that starts about 40 km below the surface . The asthenosphere is, perhaps, the primary region involved in continental drift [39, 40], although some maintain that other parts of the mantle are involved as well . This lubrication and mobility in the asthenosphere would have allowed the first movements of the tectonic plates, and the Mid-Atlantic ridge began to unzip. On earth several asteroid impacts closed the Mesozoic Era, about 65 million atomic years ago at the Cretaceous/Tertiary boundary. The dinosaurs would have been decimated. Wild fires destroyed much vegetation. The layer of iridium from asteroid impacts and soot from the wild fires is virtually global. This was the time of Peleg in the fifth generation after the Flood (Luke 3:35-36) when the continents were divided (Genesis 10:25). When the light-speed correction is applied, the atomic date for this event closely approximates to 3005 BC. The basaltic Deccan Traps in India, whose origin may have been either through an igneous event or impact related, were also outpoured at the time of this disaster . If an impact origin for the Deccan Traps is discounted, the major impact at this time was in the Yucatan (near the mid-Atlantic rift) leaving a crater at least 150 km wide. Other impacts at this time also formed the Manson, Karn, Kamensk and Gusev craters . The significant Lunar crater Tycho also dates from the late Cretaceous . It is thus possible that this event was contemporaneous with the formation of these other craters, as the light-speed correction brings it very close to the BC date for Peleg on the LXX chronology. The large impact near the mid-Atlantic rift may have accelerated the rate of continental drift. Tectonic plate movement and rifting would also have been enhanced by very low mantle/asthenosphere viscosities, which were themselves due to peak temperatures, significant water content, and high, but rapidly dropping, light-speed values. Separating continents may have generated a series of tsunamis. Mountains were also being upthrust by recently activated tectonic forces. This might also imply chronic earthquake activity and persistent volcanism. The impacts as well as the changing distribution of masses both on and in the earth may have increased the axis tilt to something of the order of 28 degrees or more according to the observational data . The high axis tilt, mountain building and volcanism would all contribute to annual extremes of climate. The mammals with their stable body temperatures were most able to cope with these conditions. Among the plants, the angiosperms became predominant with their seasonal flowering and fruit bearing. These plants include most deciduous trees, which are more able to withstand seasonal extremes. Continental drift would have resulted in isolated populations, which in turn would have brought about localised dominances. As the Era progressed, most giant forms would have died out due to new extremes of climate. From a study of oxygen isotope ratios in shells from the Atlantic, we know that ocean temperatures dropped progressively from the close of the Mesozoic throughout the Cenozoic Era that followed . Once surface temperatures dropped below freezing, the initial stage of the ice-age began. Because of the destruction caused by these events, and the new rigorous weather conditions, numbers of people were probably forced to seek shelter in caves. They would have to get sustenance where they could find it, hunting animals, digging up roots and getting what food they could. Suitably shaped rocks would have had to suffice for weapons, even before wood and/or bone were used. After conditions had stabilised, and basic needs had been met, there would be time to re-establish civilisation, work with metals, plant corn, and build homes. This trend is simply the recovery sequence from a series of huge natural disasters. The book of Job was probably written at this time, as a study of its contents reveals familiarity with many of the processes mentioned above. Indeed, Job is probably an abbreviated form of Jobab who is listed as a nephew of Peleg in Genesis 10:29. From a linguistics point of view, Jobab and Job in the Hebrew texts of Genesis and Job can be the same name in different families of the same language group . Therefore, with Peleg as his uncle, it seems that Jobab probably lived during those traumatic times. As those times were coming to a close, the 1st Dynasty in Egypt probably commenced. The discussion in "Creation and Catastrophe"  suggests that this event probably took place during the period 2783 BC to 2767 BC. About the same time, roughly 2765 BC, the main function governing light-speed behaviour had almost reached the limit of its decay pattern. However, the secondary function that is apparent in the astronomical and archaeological data is an oscillation, which is still damping out. This oscillation governed the position of the first light-speed minimum, which occurred around 2375 BC. The most recent minimum seemed to occur around 1980 AD . As the effects of the ice-age began to taper off, another global event assisted that process. This event changed the earth's axis tilt from more than 28 degrees, back to the present 23.5 degrees. This event, too, may have been an asteroid or comet impact, though other viable mechanisms have been discussed . Whatever the cause, the improved climatic conditions allowed the eventual re-establishment of major cultures. Studies of this event by the late Government Astronomer for South Australia, George Dodwell , and USA researcher M. M. Mandelkehr  lead to the conclusion that the date was close to 2345 BC, with climatic, archaeological, and geological changes occurring globally. At this same time, the movement of the earth's virtual geomagnetic pole position showed a sudden change in direction, which was also an indication that an important global event happened then . Although the matter is still open for discussion, it appears that this event may well have marked the close of the 5th Dynasty in Egypt, at least according to some likely chronologies . This brings us down to the less turbulent days of Abraham, who lived from 2304 to 2129 BC on the chronology adopted here. An archaeologist, Prof. D. N. Freedman of the University of Michigan made some important comments on this matter. As a result of the discovery of the Ebla tablets, written during the 23rd century BC, he commented: "It is now my belief that the story [about Abraham] in Genesis 14 not only corresponds in content to the Ebla Tablet, but that the Genesis account derives from the same period. Briefly put, the account in Genesis 14, and also in Chapters 18-19, does not belong to the second millennium BC, still less to the first millennium BC, but rather to the third millennium BC" . This evidence thus lends credibility to the dating for Abraham adopted here, as does the chronology accepted by the Church Fathers as outlined by Theophilus of Antioch . This, then, would indicate that Abraham's visit to Egypt occurred around 2229 BC, which was in the reign of Pharaoh Pepy II, if some recent studies are accepted . By this time, the sequence of global catastrophes was over, although we have records of continuing local catastrophes over the time since then. According to the astronomical data, light-speed has undergone an essentially smooth decay, which would have been mirrored in the behaviour of the atomic clock. These astronomical data indicate that the geological column may well have been laid down progressively over a period of about 2000 orbital years, punctuated by a series of catastrophes that caused the major extinctions noted in the fossil record . Essentially, the fossil record is a creation/catastrophe new-dominance sequence. Timewise, the build-up of Precambrian (Cryptozoic) strata took about 1000 orbital years, while nearly 1000 further years elapsed during which much of the Phanerozoic strata were deposited. The demarcation between the Cryptozoic and Phanerozoic strata was probably Noah's Flood if this model is accepted. 1In those days Noah saw that the earth became inclined, and that destruction approached. 2Then he lifted up his feet, and went to the ends of the earth, to the dwelling of his great-grandfather Enoch. 3And Noah cried with a bitter voice, Hear me; hear me; hear me: three times. And he said, Tell me what is transacting upon the earth; for the earth labours, and is violently shaken. Surely I shall perish with it. 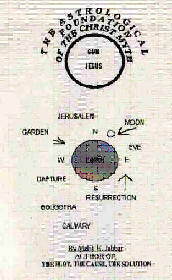 4After this there was a great perturbation on earth, and a voice was heard from heaven. I fell down on my face, when my great-grandfather Enoch came and stood by me. 9Afterwards my great-grandfather Enoch seized me with his hand, raising me up, and saying to me, Go, for I have asked the Lord of spirits respecting this perturbation of the earth; who replied, On account of their impiety have their innumerable judgments been consummated before me. Respecting the moons have they inquired, and they have known that the earth will perish with those who dwell upon it, (59) and that to these there will be no place of refuge for ever. 2That they may be for judgment, and for the destruction of all those who remain and dwell upon the earth. 3And the Lord of spirits commanded the angels who went forth, not to take up the men and preserve them. 4For those angels presiding over all the mighty waters. Then I went out from the presence of Enoch. 13In those days shall the waters of that valley be changed; for when the angels shall be judged, then shall the heat of those springs of water experience an alteration. 14And when the angels shall ascend, the water of the springs shall again undergo a change, and be frozen. Then I heard holy Michael answering and saying, This judgment, with which the angels shall be judged, shall bear testimony against the kings, the princes, and those who possess the earth. Note from Author, Malik Jabbar: These excerpts from the Book Of Enoch are focused on ancient scripture that reports shifts in the Orbit and Axis inclination of our planet. I will cover this subject and explain the Cycles in Book Four. S.O.A.S. Library at the University of London. 65.1 And in those days, Noah saw the Earth had tilted and that its destruction was near. 65.2 And he set off from there and went to the ends of the Earth and cried out to his great-grandfather Enoch; and Noah said three times in a bitter voice: "Hear me, hear me, hear me!" 65.3 And he said to him: "Tell me, what is it that is being done on the Earth, that the Earth is so afflicted and shaken, lest I be destroyed with it!" 65.4 And immediately there was a great disturbance on the Earth and a voice was heard from Heaven and I fell upon my face. 65.5 And my great-grandfather Enoch came, stood by me, and said to me: "Why did you cry out to me, with such bitter crying and weeping? 65.6 And a command has gone out from the Lord against those who dwell upon the dry ground that this must be their end. For they have learnt all the secrets of the Angels, and all the wrongdoings of the satans, and all their secret power, and all the power of those who practice magic arts, and the power of enchantments, and the power of those who cast molten images for all the Earth. 65.7 And further, how silver is produced from the dust of the earth and how soft metal occurs on the earth. 65.8 For lead and tin are not produced from the earth, like the former; there is a spring which produces them, and an Angel who stands in it, and that Angel distributes them." 65.9 And after this, my great-grandfather Enoch took hold of me with his hand, and raised me, and said to me: "Go, for I have asked the Lord of Spirits about this disturbance on the earth."